This is the process that you will follow to stand up microservics and safely transition the application's traffic away from the monolith. This is the starting configuration. The monolithic node.js app running in a container on Amazon ECS. 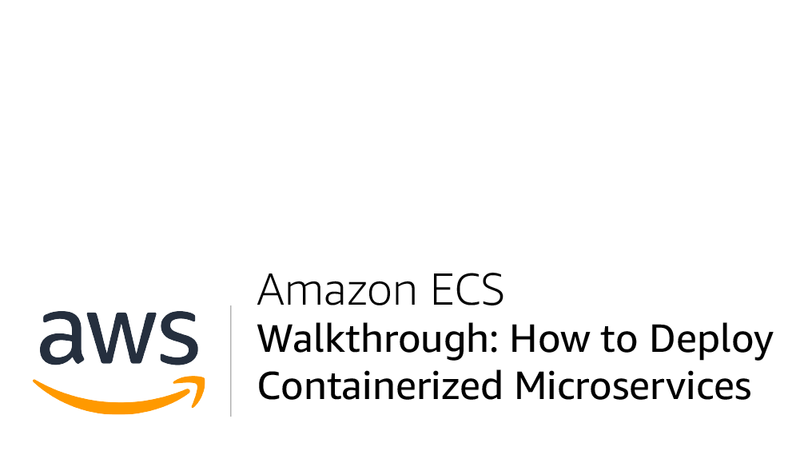 Using the three container images you built and pushed to Amazon ECR in the previous module, you will start up three microservices on your existing Amazon ECS cluster. Like in Module 2, you will add a target group for each service and update the ALB Rules to connect the new microservices. By changing one rule in the ALB, you will start routing traffic to the running microservices. Once everything is healthy, shut down the monolith. 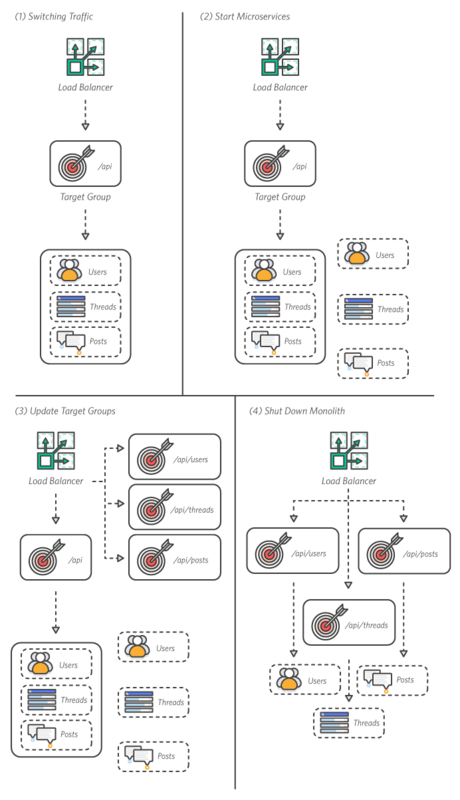 Follow the step-by-step instructions below to deploy the microservices. Click on each step number to expand the section. You will deploy three new microservices onto the same cluster you have running from Module 2. Like in Module 2, you will write Task Definitions for each service. ⚐ NOTE: It is possible to add multiple containers to a task definition - so feasibly you could run all three microservices as different containers on a single service. This however, would still be monolithic as every container would need to scale linearly with the service. Your goal is to have three independent services and each service requires its own task definition running a container with the image for that respective service. You can either these Task Definitions in the console UI, or speed things up by writing them as JSON. To write the task definition as a JSON file, select Configure via JSON at the bottom of the new Task Definition screen. Like in Module 2, you will be configuring target groups for each of your services. Target groups allow traffic to correctly reach each service. Check your VPC Name: The AWS CloudFormation stack has its own VPC, which is most likely not your default VPC. It is important to configure your Target Groups with the correct VPC. Navigate to the Load Balancer section of the EC2 Console. You should see a Load Balancer already exists named demo. Select the checkbox to see the Load Balancer details. Note the value for the VPC attribute on the details page. Navigate to the Target Group section of the EC2 Console. Configure the Target Group (do not modify defaults if they are not specified here): Name = [service-name] Protocol = HTTP Port = 80 VPC = select the VPC that matches your Load Balancer from the previous step. This target group is a 'dummy' target. You will use it to keep traffic from reaching your monolith after your microservices are fully running. You should have 5 target groups total in your table. The listener checks for incoming connection requests to your ALB in order to route traffic appropriately. Right now, all four of your services (monolith and your three microservices) are running behind the same load balancer. To make the transition from monolith to microservices, you will start routing traffic to your microservices and stop routing traffic to your monolith. Select View/edit rules > for the listener. Select the + and insert rule. Select the back arrow at the top left of the page to return to the load balancer console. Navigate to the 'Clusters' menu on the left side of the Amazon ECS console. Under the services tab, select Create. It should only take a few seconds for all your services to start. Double check that all services and tasks are running and healthy before you proceed. Right now, your microservices are running, but all traffic is still flowing to your monolith service. Select View/edit rules > for the listener on the demo load balancer. Delete the first rule (/api* forwards to api). Update the default rule to forward to drop-traffic. Turn off the Monolith: Now, traffic is flowing to your microservices and you can spin down the Monolith service. 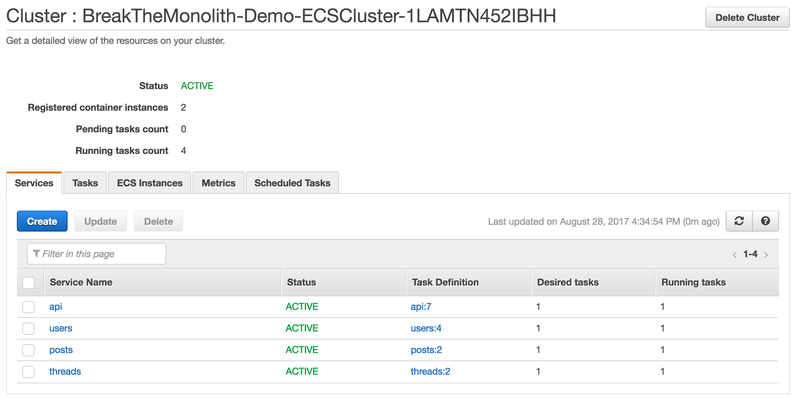 Navigate back to your Amazon ECS cluster BreakTheMonolith-Demo-ECSCluster. Select the api service and then Update. Change Number of Tasks to 0. Amazon ECS will now drain any connections from containers the service has deployed on the cluster then stop the containers. If you refresh the Deployments or Tasks lists after about 30 seconds, you will see that the number of tasks will drop to 0. The service is still active, so if you needed to roll back for any reason, you could simply update it to deploy more tasks. Select the api service and then Delete and confirm delete. You have now fully transitioned your node.js from the monolith to microservices, without any downtime! Find your service URL: This is the same URL that you used in Module 2 of this tutorial. Navigate to the Load Balancers section of the EC2 Console. Select your load balancer demo-microservices. Copy and paste the value for DNS name into your browser. You should see a message 'Ready to receive requests'. ⚐ NOTE: These URLs perform exactly the same as when the monolith is deployed. This is very important because any APIs or consumers that would expect to connect to this app will not be affected by the changes you made. Going from monolith to microservices required no changes to other parts of your infrastructure. You can also use tools such as Postman for testing your APIs.